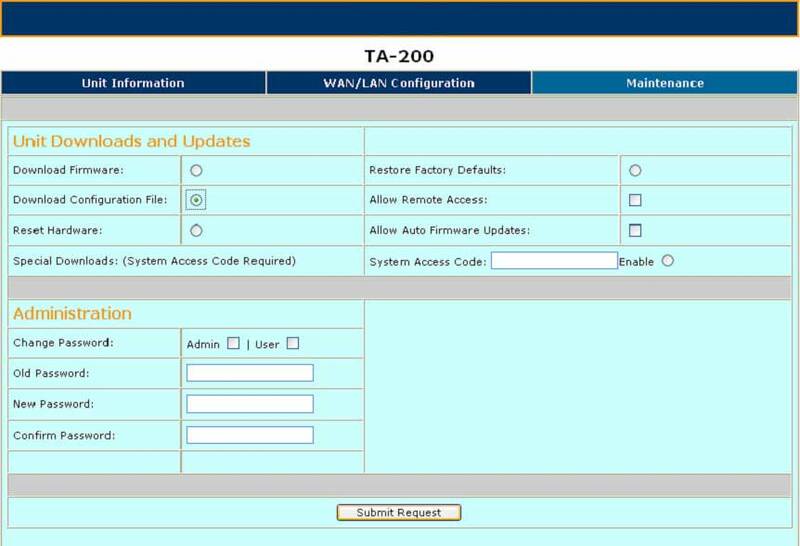 These instructions will get you up and running quickly using the basic configurations of the TA200 Adapter. 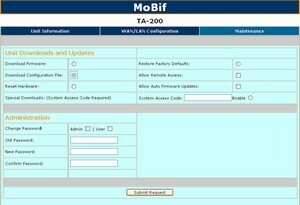 Once you have access to the Internet, you can get advanced configuration information. You will be setting up the configuration shown in typical configuration. 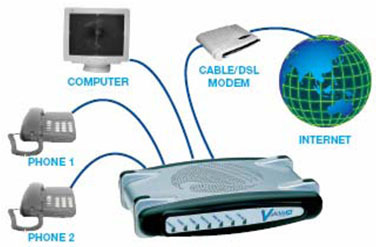 Connect the provided RJ-45 networking cable in to the input port labeled WAN on the rear of the TA200 Adapter Connect the opposite end of the same cable to the Ethernet Port of the broadband modem device (most likely a cable or DSL modem) provided by your Internet Service Provider. 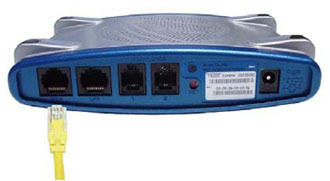 Connect a second RJ-45 networking cable to the port labeled LAN on the rear of the TA200 Adapter to your PC’s network interface, please refer to your PCs instruction manual for help on locating its network interface. Connect one end of the RJ-11 (telephone cord) to the Port label Phone 1 on the rear of the TA200 Adapter. Connect the opposite end of the same telephone cord connected to the ‘Phone 1’ port, to an analog telephone. Connect one end of the RJ-11 (telephone cord) to the Port label Phone 2 on the rear of the TA200 Adapter. Connect the opposite end of the same telephone cord connected to the ‘Phone 2’ port, to an analog telephone. Connect the Power Adapter Plug to the Power Jack in the rear of the TA200 device. Connect the AC Plug end of the Power Adapter to an electrical wall outlet. At this point you have completed the installation of all interfaces to the TA200 Adapter. 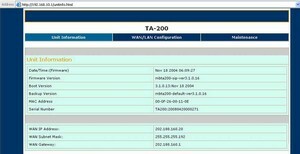 TA200 Adapter ‘LAN’ port to make configuration. Open Web browser and enter http://192.168.10.1 the following page should open. 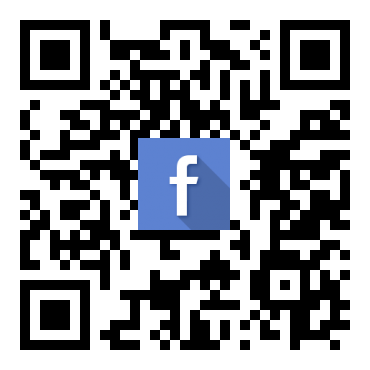 Enter the default values: Username: admin, Passsword: admin. 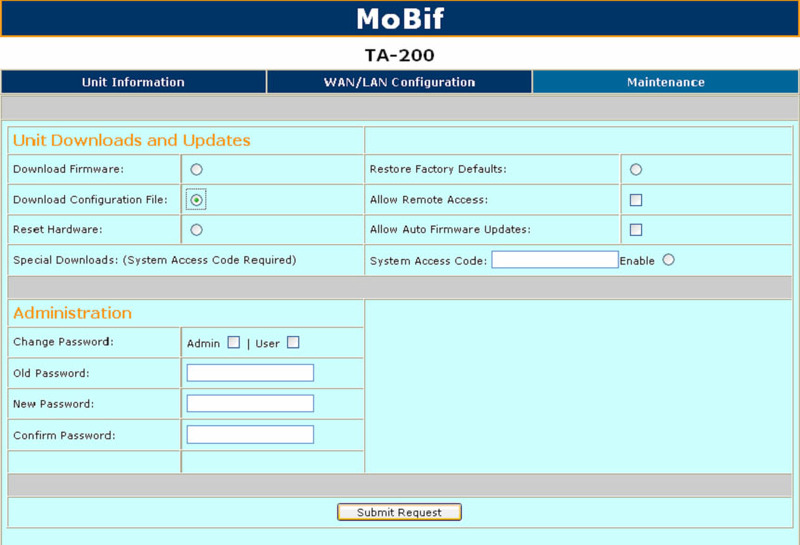 At the main page, select ‘WAN/LAN Configuration’ tab to complete the WAN Interface Configuration. Enter the ‘Login’ and ‘Password’ of your ISP ADSL or Broadband. Click the ‘Update’ button to save the setting. For the ‘IP Address Assignment’ setting, three connection types are offered through the drop-down menu. 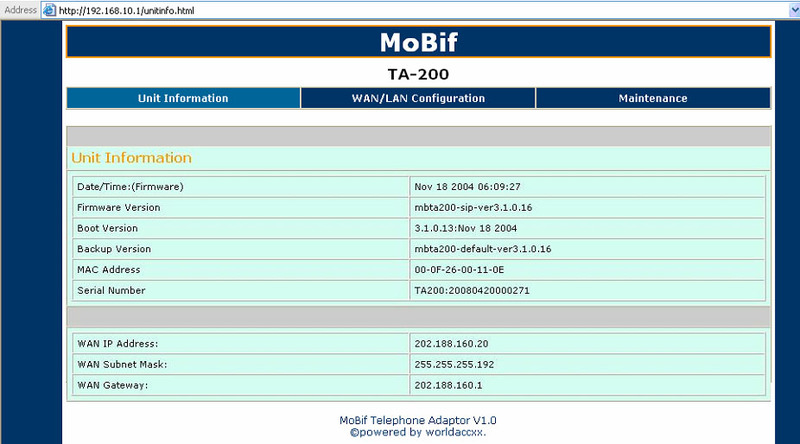 Each Setup screen and available features will differ depending on which connection type you select. PPPoE: PPPoE (Point-to-Point over Ethernet) setting is most commonly used for DSL modem connections. Enter the Username and Password as DNS supplied by your ISP provider. DHCP: The default setting for the router, DHCP is most commonly used for cable modem connection. There is no configuration necessary for this setting because the ISP automatically supplies the information. Static: Allows user to set its own fixed IP address. Commonly for ISP who provides them with only with static IP address. If you ISP assign you a static IP address, complete the ‘Static IP’. After click on ‘Update’ button, you will get this below screen, please click ‘Reset’ to save the setting. Once reset, the TA200 Adapter device will save and reboot the setting, please wait around 20 second or press ‘Main Page’ back to ‘Unit Information’. 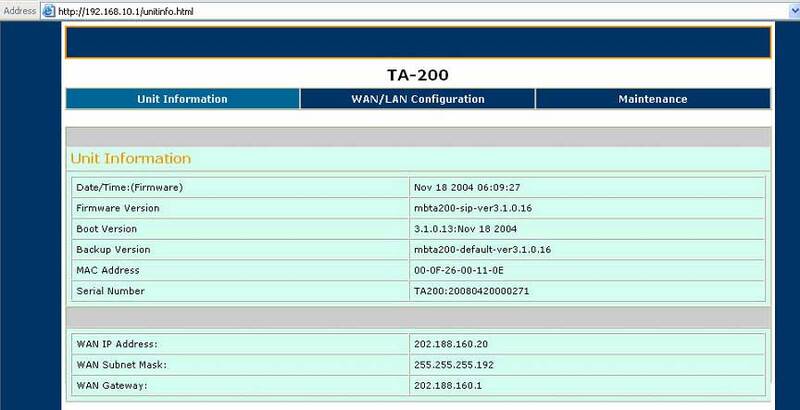 You will get a WAN IP address appears at ‘Unit Information’. Your TA200 have successful connect to internet. If you can’t hear the dial tone when pick the handset within 5 minutes, please press “***2” to download the configuration file. Place back the handset after you heard the “Tut” sound. At this moment, please wait another 5 minutes before you want make the next call. 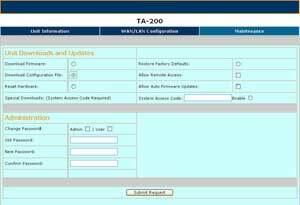 You can access to TA200 Maintenance configuration page and select ‘Download Configuration File’. Click ‘Submit Request’ to save the setting. TA200 Adaptor ‘LAN’ port to make configuration. default values: Username: admin, Passsword: admin. 20 second or press ‘Main Page’ back to ‘Unit Information’. moment, please wait another 5 minutes before you want make the next call. Configuration File’. Click ‘Submit Request’ to save the setting.